Brain protein fragments spur honey bees to be more aggressive. SOLVIN ZANKL/MINDEN PICTURESBiochemists have tracked down the brain chemicals that make so-called killer bees such ferocious fighters. The compounds, which seem to be present in higher levels in the much-feared Africanized honey bee, can make less aggressive bees turn fierce, according to a new study. The compounds may also play a role in aggression in other animals—indeed, they’ve already been shown to do so in fruit flies and mice. “This is another example of how behavior evolves in different species by using common molecular mechanisms,” says Gene Robinson, an entomologist and director of the University of Illinois’s Carl R. Woese Institute for Genomic Biology in Urbana, who was not involved in the work. Honey bees are incredibly territorial, fighting to the death to defend their hive with painful stings. But killer bees—hybrids of the relatively docile European strain of honey bee and a more aggressive African relative—are particularly fierce. The hybrids emerged after African bees were imported to Brazil in the 1950s. By the 1980s, they had spread north to the United States, outgunning resident honey bees along the way. Their massive attacks have killed more than 1000 people. Mario Palma, a biochemist at São Paulo State University in Rio Claro, Brazil, who studies social behavior in bees, wanted to understand the basis of this aggression. So he and his colleagues swung a black leather ball in front of an Africanized bee hive and collected the bees whose stingers got stuck in the ball during the attack. They also collected bees that remained in the hive. They froze both sets, sliced up their brains, and analyzed the slices with a sophisticated technique that identifies proteins and keeps track of where they are in each slice. The analysis revealed that bee brains have two proteins that—in the aggressive bees—quickly broke into pieces to form a so-called “neuropeptide,” they report this week in the Journal of Proteome Research. Researchers have found these molecules in other insects, where they seem to regulate feeding and digestion. But few had associated them with “fight” behavior, says Palma, who adds that they also increase the production of energy and alarm chemicals. They could also stimulate the nerve cells in bees needed to coordinate the stinging attack. “There is a fine biochemical regulation in the honey bee brain,” he says. Palma’s preliminary studies indicate that Africanized honey bees produce more of these neuropeptides than other honey bees do. His team hopes to eventually use these insights to develop a way to protect people from these killer bees, perhaps through a spray or chemical plug that can be applied to a hive. Africanized honeybees, commonly known as “killer bees,” are much more aggressive than their European counterparts. Now researchers have examined neuropeptide changes that take place in Africanized honeybees’ brains during aggressive behavior. The researchers, who report their results in the Journal of Proteome Research, also showed they could turn gentle bees into angry ones by injecting them with certain peptides. In the 1950s, researchers in Brazil bred Africanized honeybees by crossing European and African bees. In 1957, swarms of the bees were accidentally released, and they have been buzzing their way across the Americas ever since. Scientists currently don’t understand what makes these bees so aggressive, but the behavior appears to involve a complex network of genetic and environmental factors, regulated by neuropeptides. So Mario Sergio Palma and his colleagues wanted to examine neuropeptide differences between the brains of bees displaying aggressive and non-aggressive behavior. The authors acknowledge funding from the São Paulo Research Foundation and the Brazilian National Council for Scientific and Technological Development. Bee specialists were only able to remove a portion of the hive from the house. (KERSTIN KLAASSEN/GETTY IMAGES)A MILLION BEES HAVE invaded a Texas neighborhood, becoming aggressive this week as extractors attempted to remove them from a resident's home. The colony of bees set up a hive in the wall of an El Paso home about three years ago, but the owners said the insects have only now caused trouble. According to KFOX-TV, the elderly couple who lives in the home said they are worried the bees might attack their neighbors, pets and children, who walk past the house. Pyong Livingston, a bee specialist, attempted to remove the bees without killing them in an effort to relocate the hive. However, that appeared to have angered the colony. Rudy Reyes, a KFOX photojournalist recording the extraction, reported being stung eight times. "I went on top of the roof. I went there with my camera and he [Livingston] was with his helper," Reyes said. "As soon as they got there and opened the roof … it was like a horror movie – seeing this swarm of bees just coming out in a black cloud. Within seconds, I started getting stung by bees. I got two in the eye, in the head." Livingston identified the bees as Africanized bees, more commonly referred to as killer bees. They are a mix of Africanized and European bees and are "20, 30 times more aggressive than regular honeybees." He estimates there were about 1 million. "We were swarmed. We found that as soon as we opened up a little area we thought there were maybe 20,000 bees, it turns out to be over 100,000 bees. So they swarmed us and they started biting me all over, even with the suits," Livingston told KFOX. Although Livingston was able to remove a large part of the hive, bees were still at the house. For the entire hive to be extracted, the home's walls would need to be opened. The street is currently blocked off. Today, Governor Jerry Brown signed numerous bills into law, one of those being AB 861 (Dahle) Africanized Honey Bees. This bill would provide that a city, county, or city and county may, by ordinance, establish procedures for the abatement of a hive or comparable apparatus where Africanized or overly defensive honey bees are present. The California State Beekeepers Association thanks Assemblymember Dahle for all his work on our behalf. Please do you part in thanking the Assemblymember by calling, writing or sharing your "thanks" via social media. An act to amend Section 29321 of, and to add Section 29322 to, the Food and Agricultural Code, relating to bees. AB 861, Dahle. Africanized honey bees. The Apiary Protection Act specifies that any hive or comparable apparatus that is not occupied by a live bee colony and that is accessible to bees is a public nuisance and is subject to abatement in a specified manner. This bill would provide that a city, county, or city and county may, by ordinance, establish procedures for the abatement of a hive or comparable apparatus where Africanized or overly defensive honey bees are present. The bill would provide that, in the absence of a local ordinance, if a county agricultural commissioner determines that the presence of Africanized or overly defensive honey bees in a hive is a public nuisance, the county agricultural commissioner may take any action necessary to abate the public nuisance, as specified. The bill would also delete a provision specifying that if a county agricultural commissioner determines that any bees present in an abandoned hive or comparable apparatus are not aggressive and harbor no diseases, the abandoned hive or comparable apparatus shall not be deemed a public nuisance. To the extent the bill would impose additional duties on county agricultural commissioners, the bill would impose a state-mandated local program. Any hive or comparable apparatus that is not occupied by a live bee colony, and that is accessible to bees, is a public nuisance. The hive or apparatus shall be subject to abatement in the manner provided for in Article 14 (commencing with Section 29200). (a) The governing board of a city, county, or city and county may, by ordinance, establish procedures for the abatement of a hive or comparable apparatus where Africanized or overly defensive honey bees are present. (b) In the absence of a local ordinance adopted pursuant to subdivision (a), if a commissioner determines that the presence of Africanized or overly defensive honey bees in a hive is a public nuisance or if Africanized or overly defensive honey bees from a hive are entering land other than the land upon which the hive is located so as to endanger the public health, safety, or welfare or so as to create an unreasonable interference with the use of the property of others, the commissioner may take any action necessary to abate the public nuisance, including, but not limited to, moving, selling, destroying, or otherwise disposing of the infested hive in accordance with local administrative procedures. Honey bees are among the most well-known and economically important insects. They produce honey and beeswax, and pollinate many crops. In Georgia, a large segment of the beekeeping industry produces queens and package bees for sale to other beekeepers. Although many people make a living from bees, most beekeepers are hobbyists with only a few hives. Honey bees are not native to the New World. Most of them are descendants of bees brought to North America and South America by European settlers beginning in the 1600s. Bees from Europe did well in North America, so most areas of the United States today have managed and wild honey bee colonies of European descent. European honey bees were not as well adapted to tropical and subtropical Latin America and can be maintained there only with special care. The bees spread northward at a rate of about 200 to 300 miles per year, and today every country in Latin America except Chile has established populations of Africanized honey bees. In October 1990, the first natural colony of Africanized honey bees was found in the United States near Hidalgo, Texas. In subsequent years the bees moved in a westerly manner, eventually occupying much of the American Southwest and the southern counties of Nevada and California. By the summer of 2005, Africanized bees were confirmed east of the Mississippi with established populations in Florida. In spite of the alarm surrounding Africanization, these bees have not caused widespread or permanent chaos. Dramatic stinging incidents do occur, but the quality of life for most people is unaffected. Typically, the commercial beekeeping industries of Africanized areas suffer temporary decline and then eventually recover. European honey bees are adapted to winter survival, largely because of their ability to collect large honey supplies. Africanized bees, on the other hand, do not overwinter well and respond to food shortages by migrating. European bees make large, permanent colonies whereas Africanized bees make small to large colonies that reproduce (swarm) often. The table outlines some of the differences between the two types of bees. In areas where their ranges overlap, African- and European-derived bees interbreed, causing “hybrid zones” where bees share African and European traits. In Argentina, Africanized bees dominate in the northern semitropical regions but European bees dominate in the southern temperate areas; the area in between (ca. 32-34 degrees latitude) is a hybrid zone where bees have varying degrees of African or European traits. A similar pattern may occur in the United States, with African traits dominating in southern regions. Never knowingly approach an occupied bee nest. During daylight hours bees can be seen flying to and from their entrance. Do not disturb a swarm of bees. Call a professional bee removal service, the fire department, or your county Extension agent for help removing it. Never climb a tree, kick a log or stump, or move trash until you first check if bees are flying in and out. Keep an escape route in mind. Never crawl into an enclosed place from which you cannot quickly exit. Operators of open-cab tractors are especially at risk from hidden in-ground colonies. Keeping a veil on hand is a good safety precaution. Run away or get indoors as fast as possible if you are attacked. Never stand in one spot and swat because this only aggravates bees further and increases the number of stings you may receive. Be aware that bees may follow you for hundreds of yards. Do not stop running to hide yourself under water or in leaves, brush or a crevice because bees are likely to find you and inflict numerous stings. The single most important thing is to get away from the colony! When a bee stings, the stinger and poison sack remain in the skin of the victim, even after the bee flies away, and venom continues to be pumped into the skin. After you have safely escaped the bees, remove stingers from your skin by scraping or brushing them out. The venom of a single Africanized bee sting is no more toxic than a European bee sting (in fact, it’s a little less so). The difference is a matter of dose. Instead of a dozen or so stings, victims of Africanized bees can sustain hundreds of stings. Most people can tolerate 15-25 stings without requiring special medical treatment. Pain, redness and swelling are normal at a sting site and this does not constitute an allergic reaction. People with a history of systemic allergic reactions (fainting, trouble breathing), however, should always carry with them an emergency kit of injectable epinephrine, use it if they are stung, and then immediately see a physician. Anyone who receives more than 15-25 stings should seek medical supervision for possible delayed systemic complications. Beekeepers are the best defense Americans have against Africanized honey bees. Citizens and lawmakers need to understand this. In the fear that accompanies the arrival of Africanized bees, some groups may want to ban beekeeping in their municipalities. Without beekeepers, the density of docile European bees in an area will decrease, leaving that area open to infestation by Africanized bees. It is equivalent to “abandoning territory to the enemy.” Only beekeepers have the knowledge and resources to maintain high densities of European bees that can genetically dilute Africanized populations. Register every colony with the state Department of Agriculture. Re-queen a colony with European stock any time it becomes unusually defensive. Mark queens so you can later confirm their identity. Do not place hives near penned animals, sidewalks, playgrounds or similar high-traffic areas. Plant bushes or place barricades around the edges of apiaries. This forces bees to fly above head level and reduces the chance of them flying into people or livestock. Keep colonies at least 2 yards apart to discourage disturbed bees from exciting neighboring colonies. Beekeepers may need to re-think the practice of combining several hives on a pallet because the vibration from working one hive disturbs them all. For this reason, beekeepers in Latin America have switched to single hive stands. Use plastic-coated gloves instead of leather; bees will sting leather and the embedded stingers contain alarm chemicals that further aggravate the bees. Use white-faced veils instead of black. Africanized bees are attracted to dark objects, and a white outer surface minimizes bees massing on the veil and obstructing your vision. The interior side of the netting should be black to minimize glare. Smoke hives heavily before entering them; the bees are difficult to calm once angered. Two women hiking Mission Trail were stung by a swarm of bees on May 11, 2017.SAN DIEGO – Two women hiking in Mission Trails Regional Park were repeatedly stung by a swarm of bees Thursday morning. The women were hiking in the western area of the park near Tierrasanta with a dog when they were stung. Paramedics were at the scene assisting the women. It’s not known if the dog was also stung. Stay away from honey bee colonies. Africanized honey bees sting to defend themselves or their nest. If you can avoid disturbing them in any way, they usually will not sting. Look for bees to nest in cavities such as holes in the ground, crevices in rocks, hollow trees, discarded tires, saguaro cactus cavities, or water meter boxes. Homeowners commonly encounter colonies when doing yard work. Do not climb a tree, kick over a log or roll over a rock without checking first for bees. If you do see a colony, do not stand in front of the entrance or in the flightpath. Treat honey bee colonies as you would any other venomous creature, such as a snake or a scorpion. Be alert and stay away! When hiking or hunting in the wilderness, wear light-colored clothing. The animals most likely to attack a bee colony are skunks and bears, so honeybees respond most violently to anything that is dark-colored or fuzzy. Wear white socks, because honey bees are known to sting the ankles of persons wearing dark socks. Always wear full-length pants when hiking and long-sleeved shirts if possible. Avoid wearing shiny jewelry and leather, which attract bees. Avoid wearing perfumes or scents. Bees are sensitive to odors such as perfumes, soaps, after-shave lotions, and hair spray. These odors may either attract or provoke bees. Even sunscreens may have odors that increase your chances of an attack. Avoid excessive motion when near a colony. Bees are able to detect movement, and are much more likely to respond to an object in motion than one that is stationary. Avoid flailing your arms or swatting at bees. Do not panic if you spot a bees’ nest, just move away slowly and deliberately. Avoid operating any machinery (mowers, line-trimmers or chain saws) near nests. If you are attacked by several bees, then the best strategy is to run to shelter as quickly as possible. CERES -- A driveway covered with more than a dozen dead bees, a reminder of the night 45 Ceres families had on Sunday. “They’re bizarre, they’re flying around in motion so you don’t see that around this area,” neighbor Edgar Lopez said. Sunday night on River Valley Circle, the issue turned deadly. Ceres Fire investigators said a swarm of bees went after their owner. “For an unknown reason, unknown to him or to us, when he attempted to harvest the honey the bees became very aggressive,” said Battalion Chief Rich Scola with the Ceres Fire Department. Also caught in the attack, a neighbor and his two pit bulls and a firefighter. All the men are OK but the bee stings killed one of the dogs. Chief Scola said the bee owner was trying to harvest honey when the swarm grew angry. He said that beekeeping is only allowed in the city with a special permit. “It’s a weird situation you normally don’t hear stuff around… stuff like that around this area,” Lopez said. Families were warned to stay indoors because of the danger. Jon Campidonica said one of those angry bees flew toward his neck while he was in his backyard. “Basically, I kind of killed it. But I could already tell the stinger was out,” Campidonica said. A bee specialist was called and he took care of the thousands of bees within five hours. They were euthanized in a rural area. “To make sure that if there was any aggressive nature within that colony that they were destroyed and they were not able to repopulate somewhere else,” Scola said. Scola added the other dog was rushed to a pet hospital in Modesto. They are not aware of the animal’s latest condition. He also stressed that if you see a bee hive, do not destroy it, spray water on it, or touch it. Please call a professional beekeeper. The Ceres Police Department said they will not seek charges against the beekeeper. 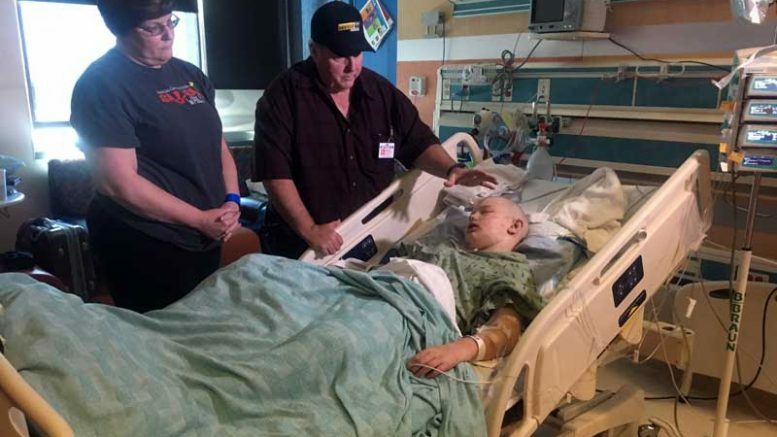 Contributed Photo/Courtesy 3TV/CBS5 News: From left, grandparents Petrea and Kreg Kunz watch over 11-year-old Andrew Kunz at the Phoenix Children's Hospital. Andrew was stung more than 400 times in a killer bee attack Monday. 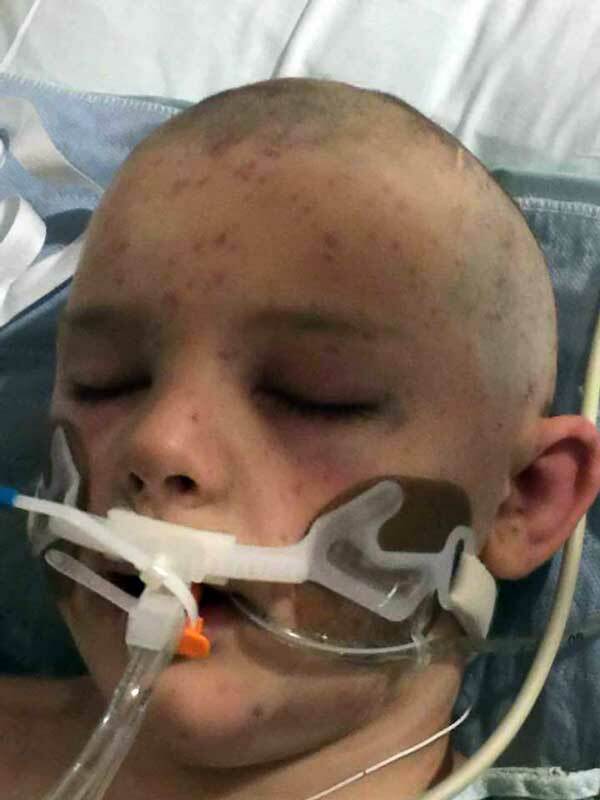 GRAHAM COUNTY – An 11-year-old boy who was swarmed by likely “killer” Africanized bees early Monday evening is being treated at the Phoenix Children’s Hospital for more than 400 stings. 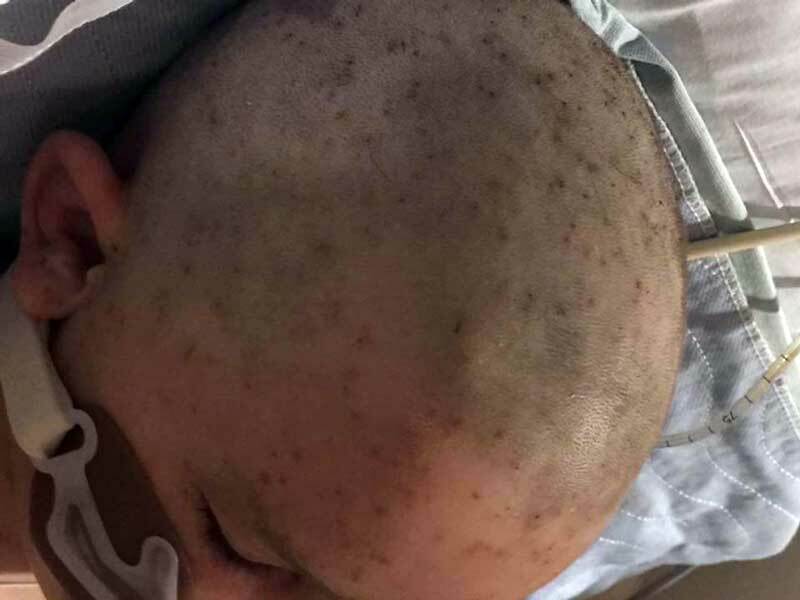 As of early Tuesday afternoon, Andrew Kunz was still in the pediatric intensive care unit but has had his intubation tube removed and indicated he was hungry, according to his grandmother, Petrea Kunz. She said he is very traumatized by the event, but he is responding well to treatment and they are hopeful he will be transferred to a step-down room later that day or the next. Petrea considers Safford Fire Chief Clark Bingham, who pulled Andrew out of harm’s way, as their savior and that Andrew would have died in that wash if not for his and other first responders’ efforts. Contributed Photo/Courtesy Petrea Kunz: Andrew Kunz had to be initially intubated after being stung more than 400 times. He is also allergic to all stinging insects. Two members of the Graham County Sheriff’s Office, Sgt. Jacob Carpenter and deputy Justin Baughman, along with Bingham were taken to Mt. Graham Regional Medical Center for multiple bee stings they suffered while rescuing Andrew. The first responders were treated and released. Carpenter was reportedly stung approximately 20 times, Bingham was hit 25-30 times, and deputy Baughman was stung about 100 times. The following day, Gila Valley Central caught up with Baughman who said he was no worse for wear. He declined to comment further at that time saying only that he was just doing his job. 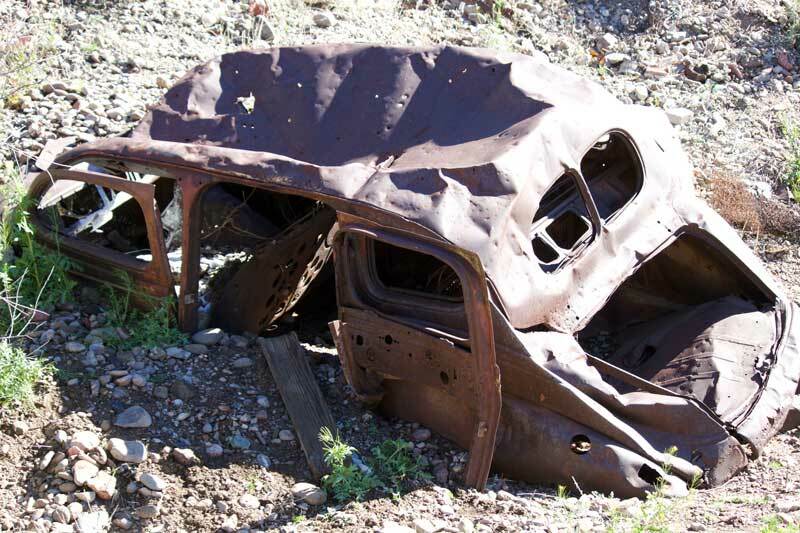 Jon Johnson Photo/Gila Valley Central: The beehive was located in this rusted car used as erosion control. Graham County Dispatch directed first responders to the area of a residence in the 1600 block of Sunset Boulevard at about 5:26 p.m., Monday, after Petrea Kunz called regarding her grandson, Andrew Kunz, being attacked by bees. The area is in between Airport Road and E. Graham Canal Road. The danger for Andrew was intensified because he was previously stung more than 90 times by ants when he was in Kindergarten and was found to be allergic to any stinging insect and carried an Epinephrine Auto-Injector (EpiPen) with him. Contributed Photo/Courtesy Petrea Kunz: Andrew Kunz suffered more than 400 bee stings. Petrea said Andrew yelled for help as he was being attacked but they couldn’t find him. At that point, a 9-year-old boy arrived and said he was with Andrew when they were attacked by bees in a gully in the desert behind the residence. She then was able to hear the general direction where he was and could see he was having difficulty climbing back up the hill to the residence. Officers then arrived, and Petrea directed them to her grandson, but they could not reach him. Bingham arrived soon after and helped Andrew away from the area. “Everybody did a great job,” Graham County Sheriff P.J. Allred said. 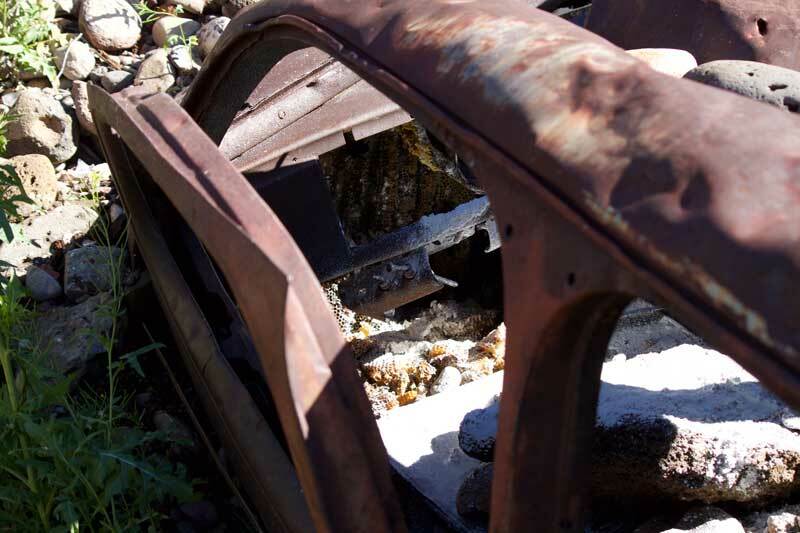 The bees had taken up residence in an old, rusted out car that was presumably placed in the gully with other vehicles to act as erosion control. It was later learned that the boys had been shooting a BB-gun at the car and the sound of the BBs against the rusted metal is believed to be what set the bees in attack mode. Clark Bingham is being hailed as a hero. Sgt. Carpenter and deputy Baughman were the first on the scene and spotted Andrew in the gully but were unable to get to him as the bees began to attack them as well. 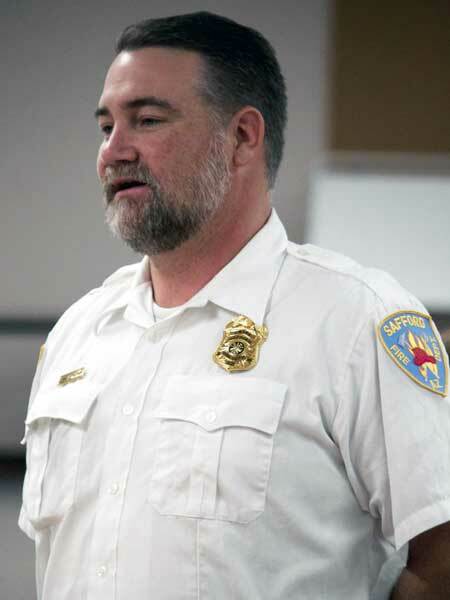 They retreated approximately 150 feet from their previous viewpoint and they and other deputies guided Safford Fire Chief Clark Bingham, who was not in a bee suit, to where the boy was engulfed in bees. Bingham picked up Andrew and tried to get him away from the bees. 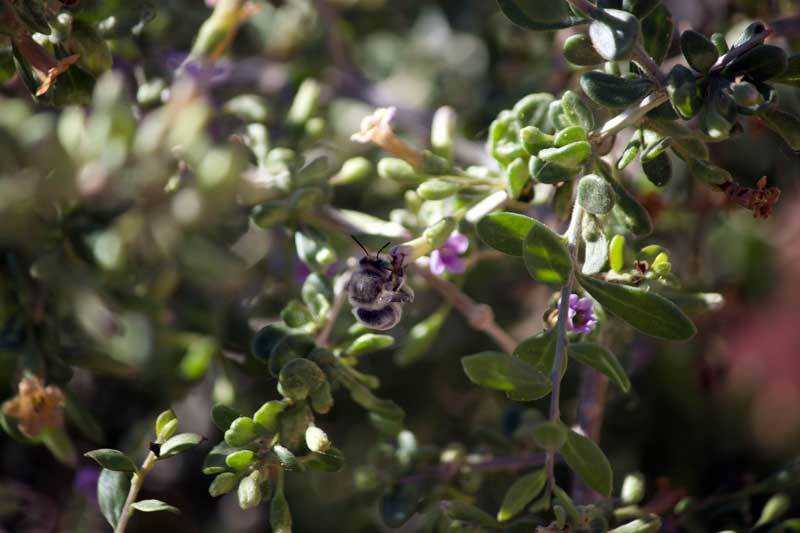 Jon Johnson Photo/Gila Valley Central: This bee was located near where the incident took place. There are still numerous bees in the area foraging for food, but they are not swarming. It was roughly a 200-yard trek through the desert to E. Graham Canal Road, where the Safford Fire Department Training Center is located. While en route to the road, other firefighters in bees suits arrived and began to battle the bees. Andrew was then loaded into a Lifeline Ambulance and taken to MGRMC. 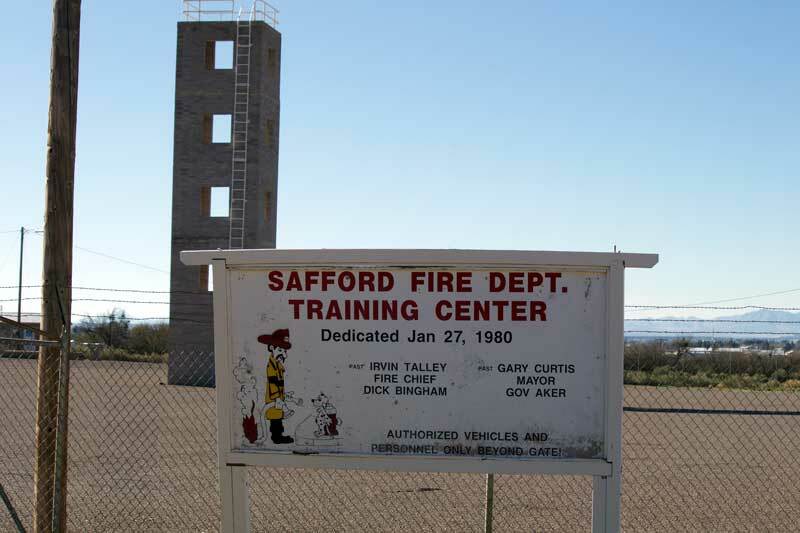 Jon Johnson Photo/Gila Valley Central: Safford Fire Chief Clark Bingham managed to get Andrew Kunz to the Safford Fire Department Training Center, which just happened to be at then end of the wash where the attack took place. After initial treatment, Andrew was intubated and flown to the Phoenix Children’s Hospital. Bingham, Carpenter and Baughman were all treated for bee stings and released. The 9-year-old boy was taken to MGRMC by his family, where he was treated and released. Additional first responders at the scene included the Safford Police Department and a rescue aid team from Freeport McMoRan Inc., which transported Bingham to the hospital. Bingham said he is also allergic to bees and the last time he was stung he began to swell up pretty bad. This time, the treatment of Benadryl and a steroid at the hospital stopped that from happening. “I am grateful for that,” he said. 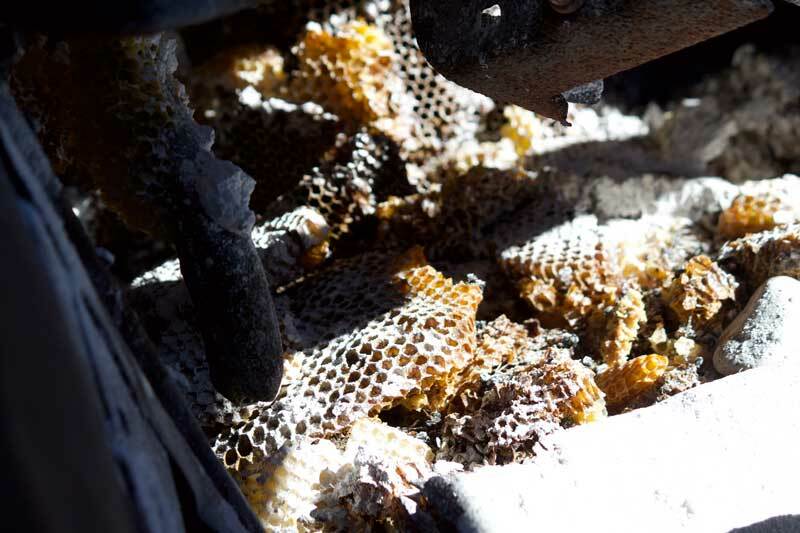 Safford Fire used soapy water on the hive and extinguished as many as they could. The following day, Mark Curley, owner and operator of Rattlesnake Exterminating, went to the site and treated it with chemicals so the bees wouldn’t return. When he arrived, he reportedly saw hundreds of bees still around the hive. Jon Johnson Photo/Gila Valley Central: Rattlesnake Exterminating went back the next day to make sure the remnants of the hive didn’t restart the colony. Jon Johnson Photo/Gila Valley Central: This different type of bee was found across the street at a residence under renovation. The unseasonably warm weather has brought the bees out to thrive and Rattlesnake Exterminating has been seeing an increase in calls. The local branch of Sodalicious is doing a fundraiser to help the family with expenses. Petrea said Andrew loves the beverage store and enjoys the Eagle Scout drink. She added that the whole family is grateful for all the well wishers and prayers and credit that for his speedy recovery. The fundraiser at Sodalicious will be Monday, Feb. 27. The location will donate 10 percent of its sales for the entire day to the Kunz family. Additionally, it will have firefighter’s boot on the counter for donations, which will all go toward the family, according to manager Hope Maxwell. 3. Do not stop running until you reach shelter, such as a vehicle or building. A few bees may follow you indoors. However, if you run to a well-lit area, the bees will tend to become confused and fly to windows. Do not jump into water. The bees will wait for you to come up for air. If you are trapped for some reason, cover up with blankets, sleeping bags, clothes or whatever else is immediately available. 4. Do not swat at the bees or flail your arms. Bees are attracted to movement, and crushed bees emit a smell that will attract more bees. 5. Once you have reached shelter or have outrun the bees, remove all stingers. When a honeybee stings, it leaves its stinger in the skin. This kills the honeybee so it can’t sting again, but it also means that venom continues to enter the wound for a short time. 7. If you see someone being attacked by bees, encourage that person to run away or seek shelter. Do not attempt to rescue the person yourself. Call 9-1-1 to report a serious stinging attack. The emergency response personnel in your area have probably been trained to handle bee attacks. 8. If you have been stung more than 15 times or are feeling ill, or if you have any reason to believe you may be allergic to bee stings, seek medical attention immediately. The average person can safely tolerate 10 stings per pound of body weight. This means that although 500 stings can kill a child, the average adult could withstand more than 1,100 stings. 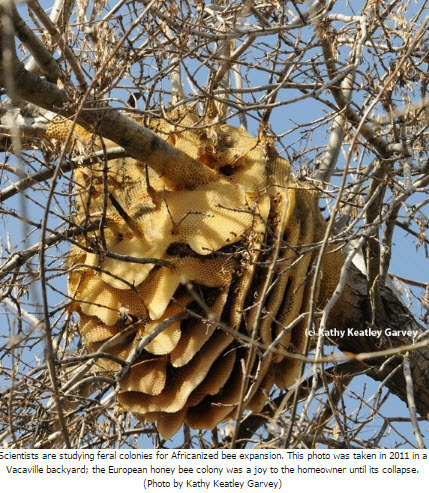 Have you ever wondered what an Africanized bee colony looks like? Have you ever wanted to see how beekeeping occurs in a developing country? The Nicaragua Bee Project is traveling down to Nicaragua on October 22 through November 5, 2016 to conduct training workshops for new and existing beekeepers. This trip will be led by Dr. Michael Bauer, a beekeeper from Waupaca, WI. He has been in Nicaragua several times to teach, train and start beekeeping groups. You will have the opportunity to travel with Dr. Bauer to Nicaragua and visit beekeeping activities in Nicaragua. You can either observe or even teach some of the training programs depending upon your desire and willingness. You can travel for one or two weeks depending upon your availability. Your cost for this trip is your airfare and food. Lodging (double room) and transportation and translations will be provided by the Nicaragua Bee Project. Current round-trip flights from Chicago to Managua are approximately $700. Food will run you $20 a day. 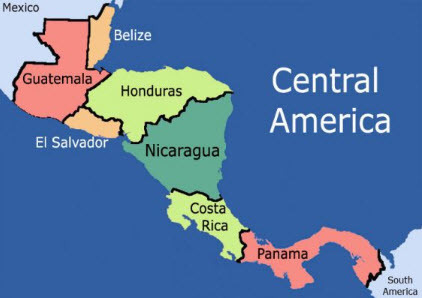 You need only a valid US passport to travel to Nicaragua. No visa is needed. You will also have opportunity to travel about the country of Nicaragua, meet local beekeepers and rural families in their homes, visit a volcano, tour historic cities and artisan markets as well as enjoy local food, drink and culture. Honeybee on a brittlebush. 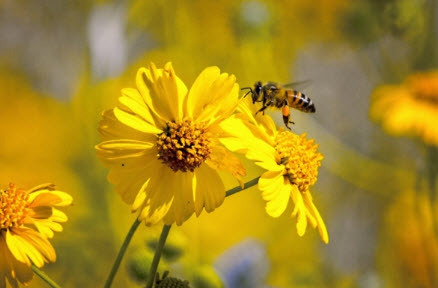 Credit: Osha Gray DavidsonOn a late May morning a pair of young hikers were walking along a popular desert trail near Mesa, Ariz., when they heard the buzzing of honeybees. 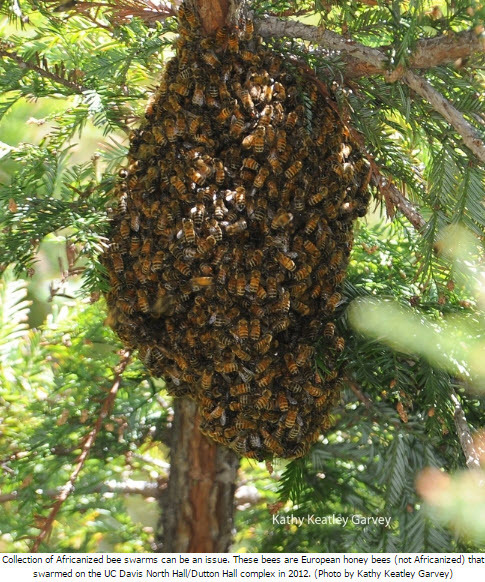 The hikers, Alex and Sonya, were unaware that they had happened upon an extraordinarily large hive, which experts later estimated contained about 50,000 Africanized honeybees. The bees gather nectar from the carpet of wildflowers that covers the desert floor, peaking in May and June, supporting colonies that quickly grow from a few thousand individuals to 10,000 bees or more. Sonya, who lived and often hiked in the area, had moved farther down the trail and took off running. But Alex, a visitor from North Dakota, may have swatted the bees. Swatting is a natural human reaction, but arm-waving and slapping at bees can turn a chance encounter into an attack, says Justin Schmidt, an insect behaviorist at the Tucson-based Southwest Biological Institute and author of the recently published book,The Sting of the Wild. “Bees don’t form images in the same way that humans do,” he explains. “They use vision primarily to detect motion, and quick or jerky movements near a nest are interpreted as a threat.” The bees respond by stinging, injecting a venom consisting primarily of the peptides melittin and phospholipase. Running and taking cover inside a park restroom probably saved Sonya’s life. But her friend wasn’t so fortunate. Rescuers found Alex on the ground near the hive, covered with bees. He was rushed to a nearby hospital but the young man soon succumbed to the toxic effects of more than 1,000 stings. Wear light-colored clothing. Honeybees have evolved to recognize threats from predators like bears, honey badgers and other dark-furred mammals. Also avoid the color red, which appears black to bees. Never approach or disturb a nest. 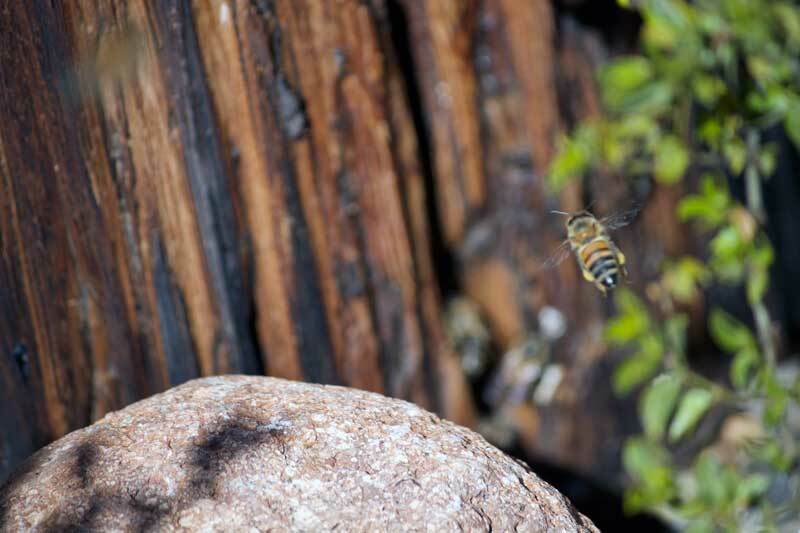 If you notice bees entering or exiting a rock crevice, a hole in the ground or a tree cavity, assume there’s a nest present and leave the area immediately. Pay attention to bee behavior. If bees fly into you or begin to swarm over or around you, they are probably trying to warn you off. Remember: don’t swat at the bees, just leave. If you accidently disturb a nest, run immediately. Try to get to an enclosed shelter (such as a car) or run until the bees stop following you. It may be necessary to get a quarter mile or more away from where the attack began. Cover your face with whatever is handy, if you can do so without impairing your vision. SAN FRANCISCO (KRON) — On Friday night, a swarm of aggressive bees attacked several East Bay residents. Two dogs were killed in the attack and several people suffered multiple stings. The incident happened in Concord, but it’s been known for sometime that an African breed of honeybees, also known as killer bees, had made its way into the Bay Area. UC San Diego researchers have been tracking the bees’ movement throughout California. Until now, the bees had only been detected in Mariposa County, just east of Merced. Now, apparently because of warmer temperatures, they have been found in the East Bay, first spotted in a Lafayette subdivision reported in September 2015. Below is a list from the United States Department of Agriculture that explains what you can do if you ever encounter an attack by bees. 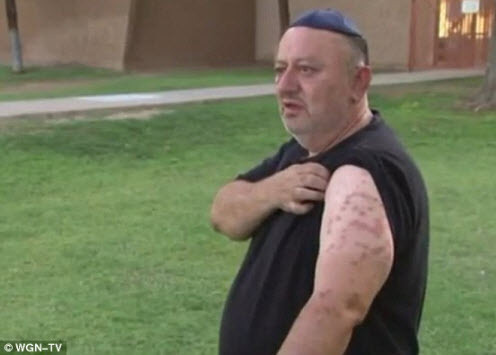 A man who was attacked by a massive swcarm of bees in Arizona and stung over 1,000 times believes that his life was saved by his pacemaker. Albert Katanov, 47, said that he was house hunting with his son in Phoenix on May 26 when he was suddenly overcome by bees. Firefighters that were called to the scene said they found seven hives attached to the home. Katanov was stung more than 1,000 times, suffered an allergic reaction and lost consciousness, WGN TV reported. Ouch: Doctors said Katanov was stung over 1,000 times, however his pacemaker shocked his heart and brought him back to life Before collapsing, Katanov made it to a house across the street looking for help, screaming out that he was not breathing. He was rushed to hospital and was lucky to survive the attack. Katanov suffererd a cardiac arrest in November and was fitted with a pacemaker, and doctors believe it was the pacemaker that saved him. They checked the device and worked out it had shocked Katanov seven times. 'When I got to the hospital, they said his pacemaker kind of saved him. Because his body went into shock,' his son, Rubin Katanov, told WGN. PHOENIX — A 23-year-old Louisiana man died after being attacked by bees Thursday morning as he and a friend were hiking within Usery Mountain Park in Mesa, the Maricopa County Sheriff's Office said. A medical exam determined the man had been stung more than 1,000 times, officials said. Just after 9 a.m., Alex Bestler and his friend were hiking the Merkle Trail when a large swarm of bees appeared without warning. Another hiker and park employees approached Bestler and found him on the ground covered in bees. They tried to approach him, but the aggressiveness of the bees forced them to stay back, the Sheriff's Office said. Two Rural Metro firefighters, a Sheriff's Office sergeant, park employees and the other hiker were able to move him onto a Sheriff's Office utility-terrain vehicle, despite Bestler still being covered in bees. Bestler was transported to a hospital, where he was later pronounced dead. The area on Merkle Trail where the incident took place was closed to the public Thursday afternoon for evaluation, the Sheriff's Office said. “These attacks are becoming more frequent and I urge the public to be aware of their surroundings when out in these areas," Sheriff Joe Arpaio said in a statement. Another bee attack on Thursday afternoon, this one in Phoenix, sent a 51-year-old man with numerous bee stings and respiratory distress to a hospital. Phoenix Fire officials said the man was experiencing periods of unconsciousness, and he was believed to be extremely allergic to the bee stings. The saga of the aggressive honey bees in Concord continues. Although Extension apicuturist emeritusEric Mussen of the UC Davis Department of Entomology and Nematology, retired in 2014 after 38 years of service, he continues his Extension work. 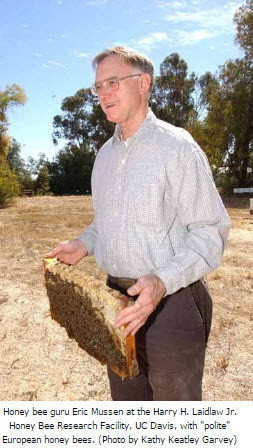 When a backyard beekeeper's hive in Concord turned aggressive (a swarm killed two dogs, attacked a mail carrier, and stung passsersby), journalists began singling out honey bee guru Eric Mussen and other UC Davis experts for interviews. Apparently, when a beekeeper moved his hive on Friday to make way for landscaping, the bees went on the attack Friday and Saturday. Most of the bees have since been destoryed. Some headlines screamed "Killer bees colonizing the Bay Area." First of all, are they Africanized bees? DNA testing awaits. “Their BEHAVIOR is very SUGGESTIVEthat they could be Africanized,” Mussen told Bug Squad today. “Until someone runs a definitive test on the on the bees actually involved in the Concord stinging incident, we may never know exactly what genotype the bees were,” Mussen points out, adding that "we have three ways to try to differentiate between Africanized honey bees (AHBs) and European honey bees (EHBs)." 1. 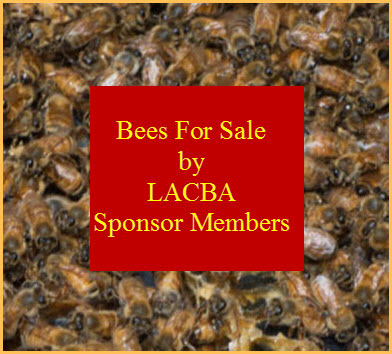 Mitochondrial DNA – The California Department of Food and Agricuture (CDFA) still conducts this type of testing once a year to clear the California Bee Breeders for queen exports into Canada. CDFA also uses this criterion as "the one" for declaring Africanization. However, its value in predicting temperament of the colony population is not particularly reliable. 3. Morphometrics - computer matching of current sample specimens to verified AHB and EHB samples using measurements of various anatomical features. Hybrids are problematic. "That type of bee was found around southern California and as far north as not too far from Angles Camp (Calaveras County)," Mussen mentioned. "Further north, they found only specimens with one or two traits, but not all three. That even occurred just into southern Oregon." “Yes, EHB colonies can behave in that nasty manner, but I think it is more likely that AHBs are involved,” Mussen says. He recalled that twice in the 1980s, swarms of bees from South America accompanied shipments of raw sugar cane into the C&H sugar refinery in Crockett (Contra Costa County). 50 percent or more - results in full-blown AHB defensive behavior. Africanized bees are hybrids of a subspecies of bee from southern Africa that was exported to Brazil to improve breeding stock and honey production. Scientists say it escaped and spread throughout South America and into Central America. It expanded into Mexico in 1985, in Texas in 1990, in Arizona in 1993, and in southern California in 1994. Africanized Bees: How Far North? Africanized honey bees arrived in southern California in 1994 and are expanding north. How far north are they now? That's the question being asked all over Central and Northern California, especially since "The Terrorizing Concord Incident" or what happened along Hitchcock Road, Concord last Friday and Saturday. Apparently a backyard beekeeper was trying to move two hives on Friday to allow his father to do some landscaping. The beekeeper reportedly moved the first hive successfully, but when he tried to move the second hive, the bees became highly aggressive and wreaked havoc. They killed two dogs, attacked a mail carrier, and stung a number of passersby. Were they Africanized bees? DNA tests will determine that. Meanwhile, what is the northern boundary for Africanized bees? There are "pockets of bees having one or two of the three criteria, but bees with all three criteria haven't been demonstrated more than about half way up the state from the southern end," Musssen said. 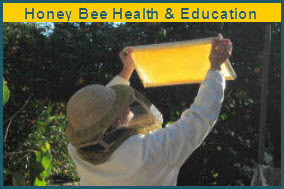 Africanized honeybees or AHBs from San Diego, etc., have all three criteria." And the farthest north they've been found? "If I remember correctly, Angels Camp (Calaveras County) vicinity was farthest north find of samples with all three criteria positive," Mussen related. "Samples around the Concord area had two criteria (up to now). Two samples from very southern Oregon had one criterion." 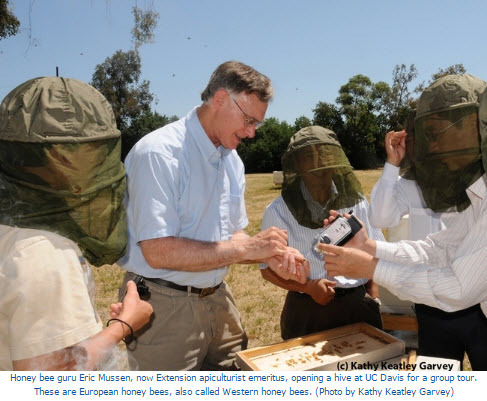 UC San Diego scientists reported in a press release issued Sept. 11, 2015 that "Africanized bees continue to spread in California." The study, published that week in the journal PLOS One, "found that more than 60 percent of the foraging honey bees in San Diego County are Africanized and that Africanized bees can now be found as far north as California's delta region," wrote news communicator Kim McDonald. Said biologist Joshua Kohn, a biology professor who headed the study: "“Our study shows that the large majority of bees one encounters in San Diego County are Africanized and that most of the bees you encounter are from feral colonies, not managed hives,” said Joshua Kohn, a professor of biology at UC San Diego who headed the study." McDonald explained that "Africanized bees are hybrids of a subspecies from southern Africa that were brought to Brazil to improve bee breeding stock and honey production, but escaped and spread throughout South America and Central America, arriving in Mexico in 1985 and Texas in 1990. Their aggressive behavior and tendency to swarm victims have led them to be dubbed 'killer bees.'" 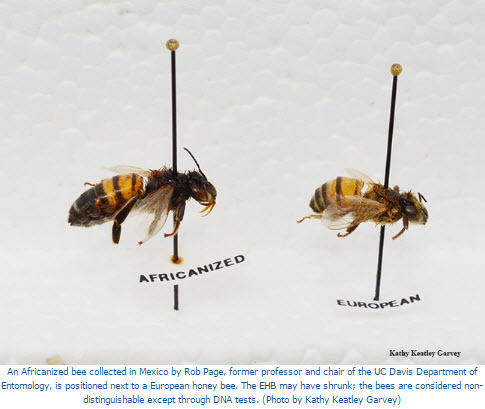 Kohn and his graduate student Yoshiaki Kono "found Africanized genetic traits in honey bees as far north as 40 kilometers south of Sacramento in the state's central valley," McDonald wrote. "In the bees they collected in San Diego, they also discovered that more than 60 percent of foraging honey bee workers have Africanized genetic traits, but that African traits are found in only 13 percent of managed or commercial hives." The scientists said the Africanized bees' northward expansion has slowed considerable, and that these bees have a limited ability to survive cold temperatures. In other words, they cannot survive cold winters. However, their presence may "improve the genetic stock of honey bees used in agriculture," according to Kohn. At UC Davis, assistant professor Brian Johnson of the Department of Entomology and Nematology, is doing research on genetic dispersion of AHBs around the state. He has collected and frozen a large number of feral bee samples from around the south and central portions of the state. After what happened last weekend, interest in AHB expansion has definitely accelerated. Stay tuned.